It is more than 20 years since I sailed with a friend in a 35′ yacht to Ithaka, the island Odysseus spent 10 years making his way back to after the 10 years he had already spent fighting on the plains of Troy. Homer’s Odyssey is brilliant evocation of a man’s soul journey at midlife and my voyage was a kind of pilgrimage: a symbolic expression of my yearning to find a life that was truly my own. Odysseus was desperate to return to his kingdom and to his wife Penelope; I didn’t even know what my kingdom was, nor did I know with whom I wanted to spend the rest of my days. I just knew that neither could be found unless I was willing to leave the dry-land certainties of my life – marriage, family and profession – and launch myself into turbulent waters. Looking back, I think I probably wanted to experience the excitement of the journey as much as – if not more than – I wanted to reach the destination. The modern Greek poet Cavafy famously enjoined us to hope that the voyage to Ithaka would be a long one. 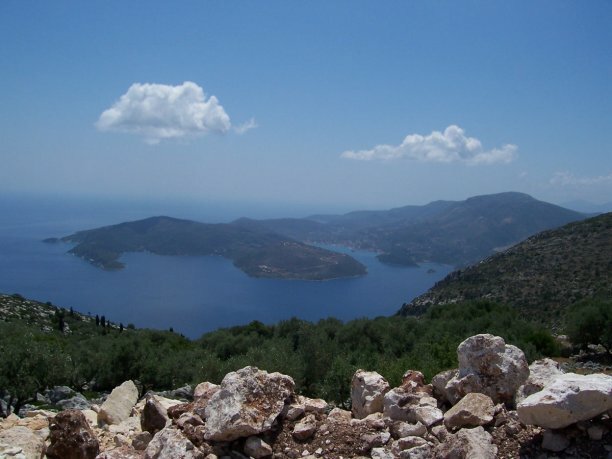 For Cavafy, the journey to Ithaka was everything. His inspiring poem is a plea (perhaps to himself) to live life to the full. It has become very popular; I’m even told that it’s frequently read at funerals. It’s a great poem but – like the Odyssey itself – has little to say about life after landing on the longed-for shores of home. When I wrote Coming Home to Story, I chose the title because it reflected the sense I had of coming home to myself; of newly arriving in my own life. Now, two years after I finished writing it, I realize that I’m not just coming home, I am home. My creative life as a writer/storyteller and my partner Chris Seeley are the island I once heard calling to me; this is Ithaka. After my initial fears when leaving dry-land behind me, I learned to love the journey. Now, I’m learning to love the juicy life that I have found 20 years later; learning – as David Whyte puts it – to “give up all the other worlds except the one to which you belong.” I’m discovering that, from this place I can say “Yes” not only to another person but to the whole of my life. Looking out of my kitchen window at the sun glinting on the sea in Lyme Bay this bright Sunday morning, I feel full of gratitude for all that has brought me here.